Kavalai Vendam directed by Deekay of Yamirukka Bayamae fame will soon begin their next schedule at Kotagiri. The film features Jiiva, Kajal Agarwal, Sunaina and others in the cast list. Updating about the movie’s progress, Deekay says, “After a gap, we are beginning our next schedule the day after tomorrow (22nd June) at Kotagiri. Since my film has an ensemble cast, it took a while to collide the dates of all artists and then to commence the shooting. The scenes require the artists’ presence together, which is also the reason for the break in the shooting schedule. We have completed 60% of the shoot till now. We are planning to complete song and some talkie portions in the impending schedule. Jiiva, Kajal, Simhaa, RJ Balaji, Balasaravanan, Sunaina and also Manobala will be present in the schedule now. Also Manthra of Dilruba fame will be seen in a comeback kind of a role. She has a good comical character to play in the film. We will shoot in Kotagiri for a while and then head to Chennai to can the remaining part”. Dhanush-Karthik Subbaraj project is very much on! 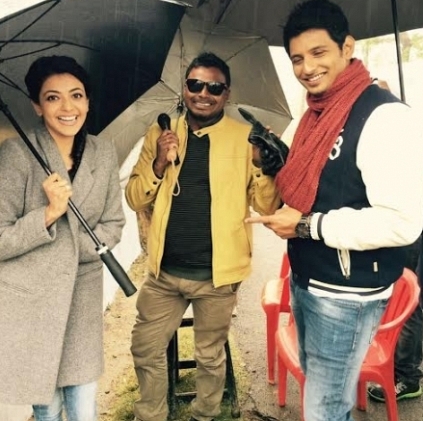 Jiiva's Kavalai Vendam To Start Off Post Pongal 2016. People looking for online information on Deekay, Jiiva, Kajal Agarwal, Kavalai Vendam will find this news story useful.